Can you say "WOW"!!! Hurry, before this Camaro 1LT Coupe is Gone! 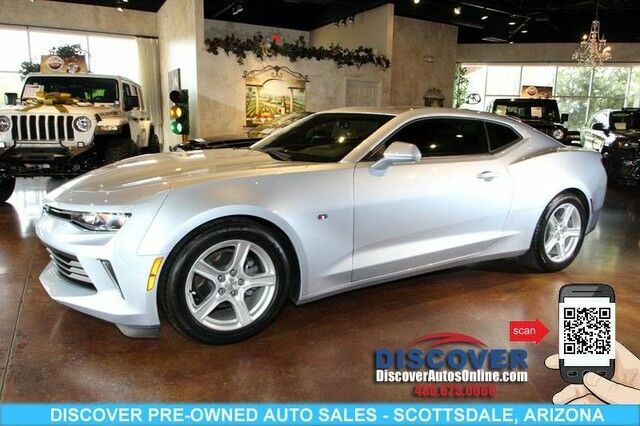 Discover Pre-Owned Auto Sales of Scottsdale Arizona is pleased to offer this beautiful 2017 Chevrolet Camaro 1LT Coupe 2D with only 26,064 miles. When you purchase a vehicle with the CARFAX Buyback Guarantee, you're getting what you paid for. The CARFAX report for this 2017 Chevrolet Camaro 1LT Coupe highlights that it's a One-Owner vehicle and that its been in an accident, it shows "Structural Damage" and we had an independent inspector come out and check the structural integrity. Please take a moment to preview the complete report at the end of the Carfax report and see for yourself what a good buy this Camaro 1LT is. An extra bonus with this Chevrolet Camaro, it's still covered by the manufacturer's warranty. This Chevrolet Camaro 1LT Coupe includes: JET BLACK, SEAT TRIM Cloth Seats SEATS, CLOTH FRONT SPORT BUCKET (STD) Bucket Seats TRANSMISSION, 8-SPEED AUTOMATIC 8-Speed A/T A/T LT PREFERRED EQUIPMENT GROUP TIRES, 245/50R18, BLACKWALL, ALL-SEASON (STD) Tires - Front Performance Tires - Rear Performance ENGINE, 3.6L V6, DI, VVT V6 Cylinder Engine Gasoline Fuel AUDIO SYSTEM, CHEVROLET MYLINK RADIO WITH 7" DIAGONAL COLOR TOUCH-SCREEN, AM/FM STEREO WITH SEEK-AND-SCAN AND DIGITAL CLOCK Smart Device Integration AM/FM Stereo Bluetooth Connection Auxiliary Audio Input MP3 Player WHEELS, 18" Aluminum Wheels SILVER ICE METALLIC *Note - For third party subscriptions or services, please contact the dealer for more information. * At DiscoverAutosOnline.com , we strive to provide you with the best quality vehicles for the lowest possible price, and this Chevrolet Camaro 1LT Coupe is no exception.